Philanthropists Trish and Dan Bell have made a $5 million gift to FIU’s Next Horizon campaign to help build a non-denominational chapel on campus. The chapel will accommodate the plurality of faiths and perspectives at FIU and serve as an interfaith gathering place for worship, contemplation, spiritual strengthening and mutual understanding. Proposed plans are for the chapel to hold up to 250 people and include meeting space for students and leaders in FIU’s interfaith community as well as those teaching spiritual/religious subjects. “Creating this dedicated space for spiritual exercise and renewal at FIU will help us in our quest to continue to turn the impossible into the inevitable and in the process make the world a better place for our sons and daughters and others who follow in our footsteps,” said FIU President Mark B. Rosenberg. 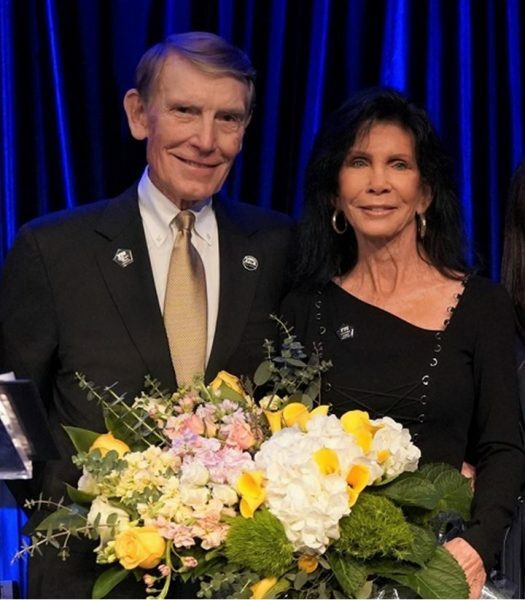 Trish and Dan Bell, members of the FIU Foundation Board of Directors, are among South Florida’s most engaged supporters. For more than 30 years, they have aimed to enhance their community through leadership and philanthropy, focusing on providing opportunities to improve the lives of underserved persons and furnishing strong backing of the arts. “Trish and I hope that this chapel will quickly become a place where people of similar as well as vastly different religious traditions and beliefs can gather to celebrate and contemplate their faiths, and meaningfully connect with others,” said Dan Bell. The diversity of the FIU community is reflected in a variety of active faith-based groups and student organizations. The goal is for the chapel to be a shared space for mutual discovery and understanding. Howard Lipman, CEO of the FIU Foundation, Inc., thanked the Bells for their commitment to the Next Horizon campaign, which aims to raise $750 million in support of student success and research preeminence. “Among the Next Horizon campaign’s key objectives are to advance student success and a vibrant, healthy Miami. The Bells’ generous contribution is helping us continue to provide an environment at FIU that respects diversity of faith and of thought,” Lipman said. Wow… what is Next Horizon campaign?